Deeply Trivial: Announcing a New Series on Deeply Trivial! Hopefully you've been enjoying Statistics Sunday with Sara! I've had a lot of fun writing them and will be using the material written thus far in my July writing project. In fact, I've tucked the book into my purse to read in the car on a road trip this afternoon. 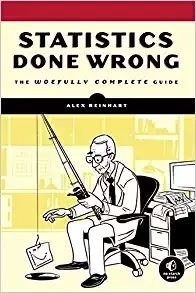 But thinking about this book, which covers some of the statistical errors and omissions that can derail your research, I started considering some of the really poor science reporting I've seen in magazines and newspapers, as well as on websites. And I thought of a great term to describe some of the abuses of statistics - either willful or accidental: statistical sins. So, introducing a new series I'll be unveiling this week (probably to be posted each Wednesday): Statistical Sins! This series won't just be about shaming people for bad statistics reporting (though that's part of the fun); it will be about teachable moments: I'll tell you (and where possible, show you) a better way. The examples will be timely - hopefully something I've encountered during the week. If you see anything you think might be a statistical sin, be sure to send it my way!